Astana, SANA- Head of the delegation of the Syrian Arab Republic Bashar al-Jaafari said his assessment of the track of Astana is a positive one as long as it serves the main “noble” aim behind coming to Astana, that is achieving the consolidation of the cessation of hostilities and the separation of the armed groups that signed the agreement and from those who refused to sign it, meaning the separation between the groups that believe in political solution and the terrorists. In a press conference following the plenary session, al-Jaafari said Astana 2 meeting has paved the way for the upcoming Geneva conference, which needs to take into account the outcomes of both meetings in Astana that should be at the core of the schedule of the next Geneva meeting. 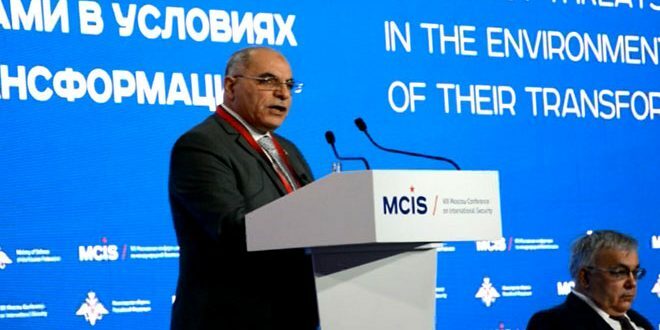 He noted that the meetings which the delegation of the Syrian Arab Republic held with the Russian and Iranian friends were “fruitful” and that they have contributed a great deal to the convening of this meeting. 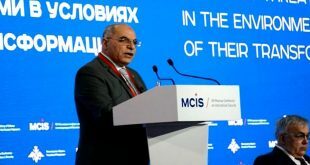 He warned that those who breach these arrangements will be considered as terrorist targets that will be combated by the Syrian Arab Army and its friends and allies. “My country, Syria, will continue its efforts to liberate every inch of its territory from the control of the terrorist groups that are know; meaning ISIS and Jabhat al-Nusra and their affiliates and those groups which do not commit to the cessation of hostilities regime,” said al-Jaafari. 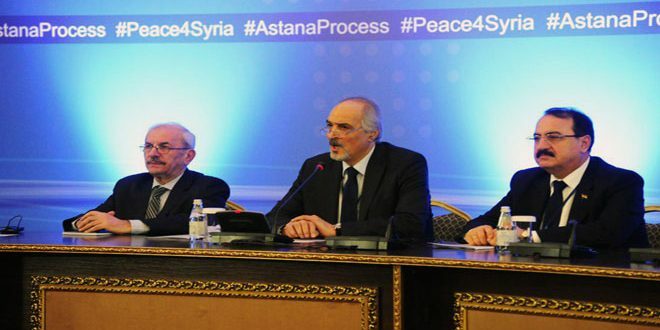 Al-Jaafari clarified that the reason why no final concluding statement was issued at the end of the meeting is the that the delegations of the Turkish side and the armed groups arrived late in Astana. He dismissed the belated arrival of the Turkish and armed groups delegations in the Kazakh capital as a proof of their lack of seriousness in form and in terms of their “clear will” to hinder and foil Astana meeting, noting that the Turkish delegation came with a low-level representation that is not up to the position of Turkey which claims to be one of the three guarantor countries. He stressed that Russia and Iran as guarantor countries and Kazakhstan as the host country have succeeded in undermining the attempts aimed at bringing efforts at Astana back to square one. “That is in terms of form. However, it terms of the substance, I would like to say that Turkey is the one responsible for the violations of the Syrian sovereignty,” said al-Jaadari. “Turkey can’t play both roles of causing a fire and fighting it at the same time,” said al-Jaafari, affirming that Turkey is now playing the role of causing fire and must withdraw its invasive forces from Syria and respect the statement of Astana 1 meeting that stressed the sovereignty and territorial integrity of Syria. If other areas would join the cessation of hostilities agreement or not, al-Jaafari said that this topic has not been discussed and military experts will deal with it. 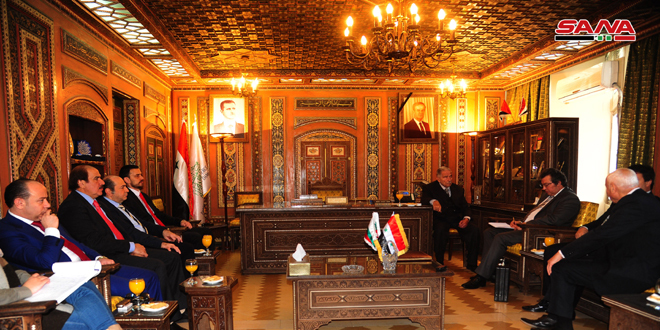 As for an agreement on the so called “joint committee” and the working team” to monitor the cessation of hostilities agreement and how Syria would deal with it practically on the ground, al-Jaafari indicated that this matter is related to “the joint operations’ group” and it is a paper issued by the names of three guarantor countries, not by the name of the meeting and this should be taken into account. He added that this paper was an issue of discussion among participants, saying that Damascus will study it and give its opinion about it later. 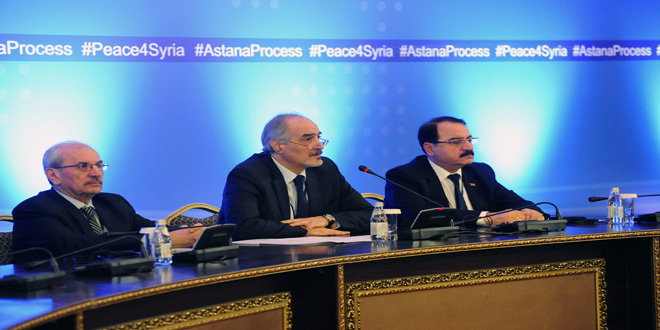 Whether the Syrian constitution was discussed or not, al-Jaafari said that the issue of Syrian constitution has not been discussed at all in Astana 2 meeting and that the constitution issue is a mere Syrian issue that must be discussed among the Syrians themselves and without any foreign interference in it, and therefore this topic was not on the table in Astana 2. As for statements about an agreement on a paper during the meeting, and a disagreement on two other papers that will be discussed during upcoming meetings, al-Jaafari said that during this meeting the three guarantor states only discussed one paper of the three papers while the two others will be discussed in upcoming Astana meetings. Al-Jaafari pointed out to an attack launched by 8 terrorist factions, since four days, on Daraa city, adding that and all those factions are backed by Jordan, so, “we are looking forward to see Jordan’s representatives’ acts in this meeting applied on the ground. “Jordan was and still a source of pain and trouble for Syrians… maybe the Jordanian share in Astana meeting as an observer will contribute to reconsidering its wrong policies towards Syria,” al-Jaafari concluded. Head of the Russian delegation to Astana meeting AlexanderLavrentyev , in turn, noted that since the first Astana meeting, there have been great efforts to secure the continuation of the cessation of hostilities regime. 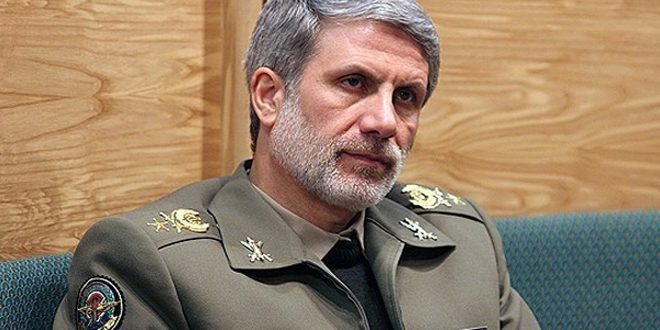 For his part, head of the Iranian delegation Hossein Jaberi Ansari stressed during the plenary session commitment to providing help in solving the crisis in Syria. “We see that the impost important role at Astana is to start dialogue on the ceasefire, and we are working on the basis of preserving the sovereignty of countries, and we call on all countries to determine their role regarding the future of Syria and its people who have suffered a lot throughout this crisis,” he said. Ansari also called on everybody to exert enough efforts to launch the Syrian dialogue, considering that the agreements already reached would help in achieving that. In a statement to the reporters, Ansari said what is important at this stage is to consolidate the ceasefire in Syria. He pointed out that Astana track is not a substitute for any other tracks, stressing however that this track has advantages that can be invested to resolve the crisis in Syria. Earlier on the day, spokesman of Kazakhstan’s Ministry of Foreign Affairs Anwar Zhaynakov announced that bilateral consultations of the delegations participating in Astana meeting were held prior to the plenary meeting. Director of the Kazakh Foreign Ministry’s Department of Asian and African Affairs Aidarbek Tumatov told reporters that the possibility of setting up an operational group that will monitor the cessation of hostilities agreement is under consideration. Tumatov added that issues related to the joining of specific areas to the agreement are also being discussed, asserting that the parties were also considering a draft final statement. Participants in the international meeting on settling the crisis in Syria in Astana plan to complete talks today and take a specific decision, according to Tumatov. The Astana meetings provide an opportunity to discuss practical matters while the political aspects of solving the crisis in Syria are considered at the Geneva talks,” Tumatov elaborated. The first Astana meeting on settling the crisis in Syria, which was held on January 23-24, affirmed in its final statement commitment to Syria’s sovereignty, independence and territorial integrity and focused on strengthening the cessation of hostilities and fighting terrorism.